The hotel is located in the heart of the Gandoca Manzanillo Wildlife Refuge. This Costa Rica hotel is a delightful relaxing place full of the magic touch of Nature; a unique idea for jungle beach accommodations. Staying at Almonds and Corals hotel offers you the opportunity to get a feeling of the jungle while having luxury accommodations in the middle of the wild rainforest. Climbing plants, bromeliad and orchids hang from the branches and like in a fairy tale, as you walk through the enchanted forest, by passages on stilts, suddenly you are in front of the magnificent Caribbean with your feet on golden sand, coconuts and the bay of Manzanillo where you can almost hear the rhythm of the Calypso. Add a restaurant with excellent meals and a marvelous staff and camping might not be so rustic after all. Almonds & Corals lodge has 25 bungalows. 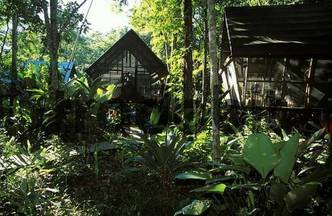 Each bungalow lies under giant trees in a forest so dense that the sun rays hardly touch the ground. The bungalows are placed over a platform lifted up on stilts and are protected by a roof. The beautiful and rustic restaurant stands in between the bungalows and the trail that leads to the beach. It has been designed to let the elements of the rainforest be as close to you as possible.The food is delicately prepared by two stupendous chefs. The menu options for lunch and dinner offer international dishes with a local flavour. Breakfast is served as a continental buffet. Transfers from San Jose area hotels or San Jose’s Juan Santamaría International Airport to hotels in the Caribbean area are $190.00 each way, for a minivan with a capacity of up to 9 passengers. Approximate time from San José is 3 hours and 45 minutes. Transfer from Juan Santamaría International Airport to any hotel in San José $35, including airport assistance, for a minivan with a capacity of up to 9 passengers.